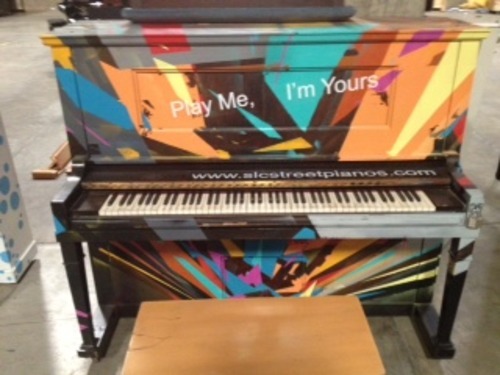 The University of Utah on Sept. 4 will host three of the "Play Me, I&apos;m Yours" pianos from last summer&apos;s downtown Salt Lake exhibition.The U&apos;s School of Music is marking the 100th anniversary of its piano department this year. To celebrate, the "Sit Down & Tickle the Ivories" pianos will be outdoors near the Library Plaza and the Union Building to welcome and encourage anyone in the campus community to take a musical break that day. There will also be scheduled performances on Sept. 4 from 11 a.m. to noon during the annual "Arts Bash" hosted by the College of Fine Arts. The pianos will be on campus from 8 a.m. to 4 p.m.The three pianos were originally part of the 2012 summer project sponsored by the Utah Museum for Contemporary Art, the Downtown Alliance and dozens of business and civic organizations. From that project, seven pianos were donated to Legacy Music Alliance (LMA), a nonprofit foundation, to be used in LMA&apos;s Instruments To Students project benefiting local schools and school children. Before they reach their final destinations, LMA arranged to put them on public display one more time in conjunction with the School of Music&apos;s "100 Years of Piano" celebration.Legacy Music Alliance was organized in 2010 as a non-profit association to bolster music education in the Intermountain West and increase Utah&apos;s stature as a prominent national music education and resource center. The Legacy Music Alliance is headed by CEO Gaylen Rust.